What are the Lava Beds? The Lava Beds is a rugged plain of lava and sagebrush, punctuated by cinder cones, and rich with geologic curiosities, archeological sites, unique plant communities, and wildlife. Located between the summit of the Medicine Lake volcano and the Tule Lake basin, its 46,000 acres link the alpine and high desert environments. Lava Beds attracts history buffs, cave explorers, wildlife enthusiasts, bird watchers, campers, geology students, photographers, and anyone seeking wilderness. Lava Beds is a treat for any student of volcanic phenomena. The landscape is dotted with spatter cones, lava flows, collapse trenches, chimneys, fissures, and cinder cones. This north flank of the Medicine Lake shield volcano is made up of layer upon layer of lava flows, built up over millions of years. Many of the flows came from Mammoth Crater, a huge pit located within the park boundary. Rivers of hot lava emanating from the crater crusted over, partially drained and collapsed, leaving sinuous chains of lava tube caves. Exploring these caves is a highlight of the visitor experience. 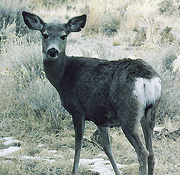 Wildlife abounds at Lava Beds. Take a hike and you are likely to see mule deer, pronghorn antelope, cougar footprints, and perhaps a bald eagle soaring overhead. Wintering bald eagles shelter in the Lava Beds as they forage here and on the shore of adjacent Tule Lake, before returning to breeding grounds in Canada and Alaska. Once an endangered species, these magnificent birds have thrived in the protected environment of Lava Beds and adjacent Tule Lake. The caves are home to two species of rare bat, the Townsends Big-Eared Bat and the Mexican Free-Tailed Bat. The bat colonies are a vital remnant of the once more extensive bat colonies in the region. Much of their habitat has been lost to nearby development and other human activities over the past hundred years. Although protected, the bats at Lava Beds are not completely safe from harm. Disturbance by cave visitors, exposure to environmental pollutants, and loss of feeding grounds outside the monument boundaries all pose potential threats. As long as 4000 years ago, an ancient people carved rock art in the shores of Tule Lake, and painted symbols in the caves of the Lava Beds. Their artifacts are found throughout the monument. Even the modern Modoc people don't know who they were or what their symbols mean. Throughout the long, cold winter of 1872-73, a tiny band of Modocs used their knowledge of this chaotic landscape to hold off a large contingent of the U.S. Army. Fighting to preserve their ancestral way of life, they repeatedly outwitted the much larger and better armed force. Athough they were eventually defeated, their skills and tenacity are legend. The Modoc War was one of the last Indian wars fought on U.S. soil. It can be relived by any visitor who crouches behind the natural lava fortress of Captain Jack's Stronghold. In 1925, President Calvin Coolidge designated the Lava Beds as a national monument, mandating that this dramatic volcanic landscape be preserved and protected, and that the battlefield of the Modoc War be memorialized. The fulfillment of this mandate lies with both the National Park Service and ourselves. We must manage the resources to maintain a healthy ecosystem, preserve its fragile features, and provide for the enjoyment and safety of visitors. In the 1920's a local miller named J. D. Howard spent his spare time finding, exploring, and naming caves. He gave them evocative names like The Catacombs, Crystal Ice, Skull, and Golden Dome. Today over 430 caves are known at Lava Beds. Each is special and contains features found nowhere else, and their resources are waiting documentation. The Depression-era Civilian Conservation Corps worked to create public access to some of the caves and establish this park. Now at the start of the 21st Century, numerous volunteer investigators are generating the information and knowledge needed to assure its preservation and continued access.